I hosted an SEO training workshop for Tech Manchester on Monday, taking the stage in front of a bunch of entrepreneurs who had signed up for the free event. It was held at the UK Fast campus in Hulme. I walked onto a rather large stage to give a fully immersive three hour SEO speaking marathon packed with information. 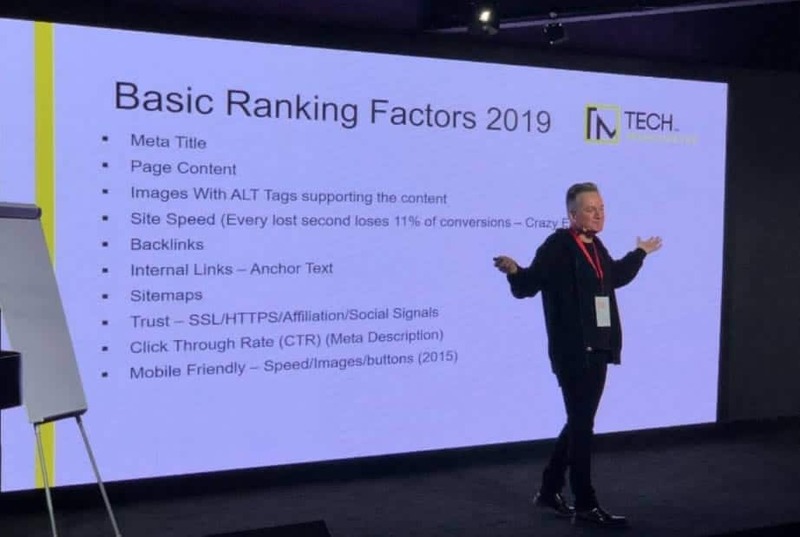 The theme of the talk was “How to rank your website in 2019“. I went through all of the basic ranking factors before revealing solid advice, hacks & tricks to nail each one. From site speed and accessibility to on page content through keyword research and much more! The attendees were hammered with information, but took it in great spirit, involving themselves in every area. I spoke with many of them individually about their businesses, helping and advising along the way. It made the whole event very personal, but also pretty exhausting! I’ll remember to drink more water during the next one! During the session, we identified the most important tool you need to use to carry out keyword research – your brain! 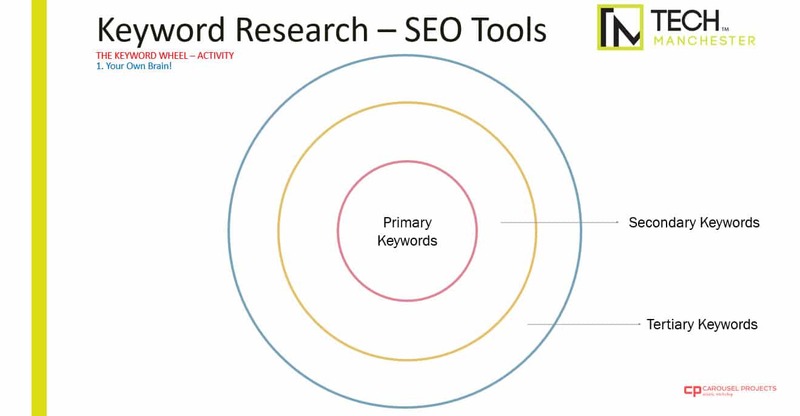 I used a new technique I have developed called the ‘The Keyword Wheel’ to identify Primary, Secondary and Tertiary Keywords. Thinking about a great blog post, a webpage or even your own website. Put the primary theme in the centre of the wheel. For example Bikes. Add synonyms, Bicycles. 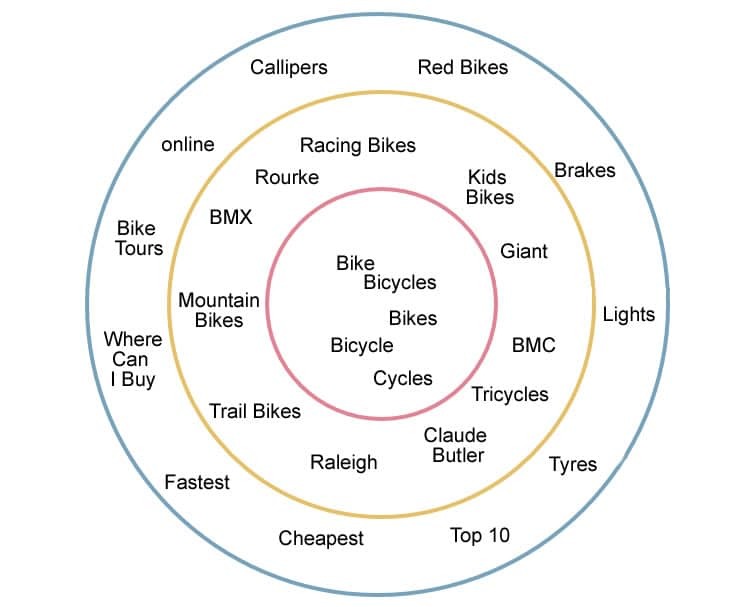 Then start to fill in the secondary keywords: Mountain Bikes, Trail Bikes, Racing Bikes. Then the tertiary keywords: Raleigh, Handlebars, Frame, Seat, Callipers. By the time you have fully filled the wheel in you have the perfect starting point for a great post, page or even the structure of a website. The wheel can be amended by taking each of the primary keywords and synonyms and checking them in Google Search, Keyword Everywhere or any other tool which will help to establish search volumes, relevancy and click through rate (ctr). This is my unique attempt at demystifying keyword research! Use your brain as much as possible – it’s your site and you know where to start – the keyword wheel gives you something – as Warren Buffet says – FOCUS! To quote John Muller, Head of Search at Google – ‘What is Google looking for on a webpage? Awesomeness!